Our Inaris HbbTV Solution provides all software components as an extension to existing DVB/IPTV software deployments to support HbbTV applications. We provide our HbbTV Solution as an extension for our own Inaris DVB/IPTV Middleware or for any other customer-specific DVB middleware. Our software is platform-independent and thus well suited for integration on any kind of TV and STB platform. Get in contact with us to get detailed information and evaluation material. Our HbbTV Solution is fully compliant with the HbbTV standard version 1.5. We fully support the HbbTV 2 Media Synchronisation and Companion Screen features. We provide a generic interface to the web browser. Integrations may be done with any CE-HTML compliant browser e.g. customized Chromium, WebKit, or Opera. 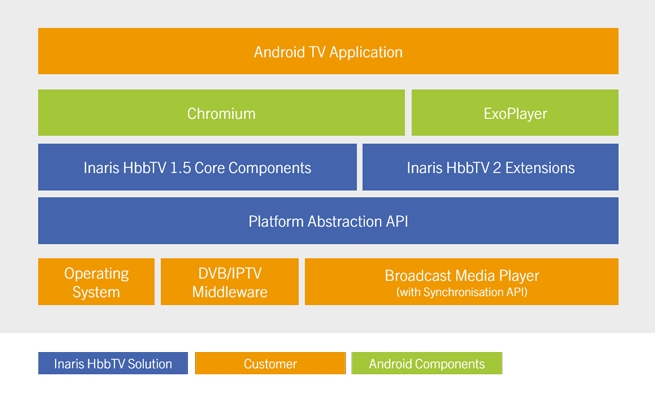 All components of our HbbTV Solution are implemented platform and DVB middleware agnostic. We provide our Inaris HbbTV SDK that runs out of the box. Clean interfaces are provided for the browser and middleware integration. Our HbbTV Solution consists of software modules with extensive unit tests. The HbbTV test suite is executed automatically every day. Our HbbTV experts will help you to find the right interfaces with your software and support you during integration phase. From the beginning we are an active member of the HbbTV Association. Our expertise will help you to build successful products. You can integrate with any Web Browser supporting the Netscape Plugin API (NPAPI) such as WebKit or with Chromium using our Chromium browser plugin. Our OIPF based Platform Abstraction API will come with stubs to allow you doing a step by step integration with your DVB/IPTV Middleware. For devices running on Linux and other operating systems, we will provide you clean APIs that are used to integrated with your Operating System, DVB/IPTV Middleware, Media Player, and Web Browser. For HbbTV 2 Companion Screen devices, we will enable you to build the manufacturer specific Companion Application that can interact with your HbbTV 2 Terminal. On Android platforms, there is wide range of software and functionality available that can be used for your HbbTV integration. 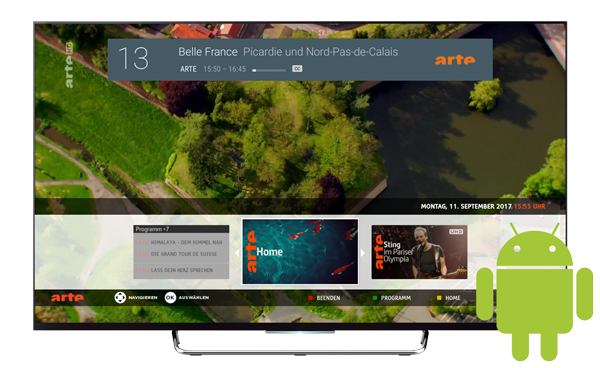 We have prepared a software package especially for Android that is based on our Inaris HbbTV Solution for Linux but integrates some pieces of software that make the life easier for you. Pre-integrated with the Chromium browser (browser plugin and CE-HTML extensions). Integration with the ExoPlayer for broadband media playback is available. 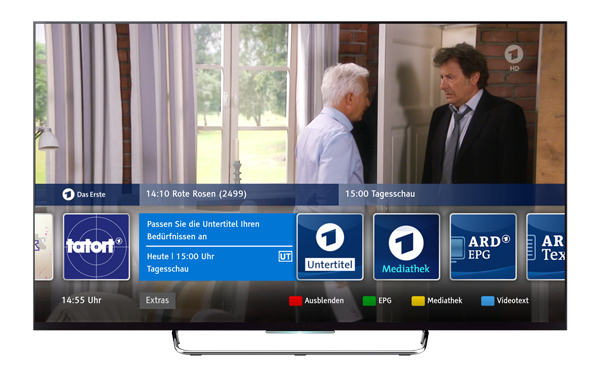 Direct integration with DVB middleware using our HbbTV Platform Abstraction API (OIPF based). Integration using Android’s TV Input Framework (TIF) supported. For Android TV devices we will provide you a pre-integrated solution using Chromium and the ExoPlayer. This software package will be your starting point for the integration with either directly your DVB/IPTV Middleware using the OIPF based Platform Abstraction API or your TV Input Service. We constantly extend our HbbTV Solution to meet the requirements of the newest specifications. Read more about our latest HbbTV developments.